My first published writing appeared as “Letters from London” in The Grants Pass (Oregon) Daily Courier in 1963. I’d spent part of my college freshman year ther with a Peace Corps relative, The Experiment in International Living. A few years later my confession and romance stories were published popular magazines. This led to my leading a romance-writing seminar at the Pacific Northwest Writers Conference. 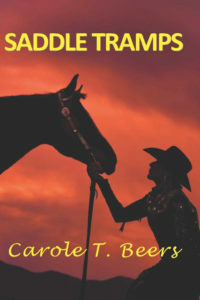 My Western lifestyle stories appeared in Western Horseman. As a Seattle Times reporter, columnist and critic from 1969 to 2001, I wrote 7,000 stories. I became The Times’ Dance Critic in 1974 after studying dance criticism at Mills College under a National Endowment for the Arts Fellowship. Reviews, news accounts and profile obituaries written in the digital age may be read on the Web by typing key words “Carole Beers Seattle Times.” Be diligent –some are listed several screens back! Published June 26, 2016: My lighter contemporary mystery/romance, Saddle Tramps, from A-Argus Books/W &B Publishers. Find the book in eBook or trade paperback — a terrific beach or fireside read — at online vendors, or at select local and regional bookstores. You can enjoy samples of the book with the Amazon “Look Inside!” feature, and also in its Kindle “Download a Free Sample” tab. 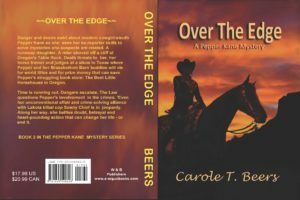 Published September 6, 2017: Over the Edge—Book Two of the Pepper Kane Mystery Series. The danger and romance escalate as our sassy, middle-aged cowgirl sleuth and her lover investigate a trio of crimes in Oregon and Texas. And try to keep themselves and their love alive! Published April 25, 2018: Ghost Ranch—Book Three of the Pepper Kane Mystery Series. Pepper questions her deepest beliefs and desires while rushing to learn who killed a woman in the abandoned cabin of a famous writer. She and a fellow horsewoman had hoped to turn the riverfront property into a guest ranch. But unless she finds the killer, with the help of Sonny Chief, her dreams—if not her very life—will go up in flames. 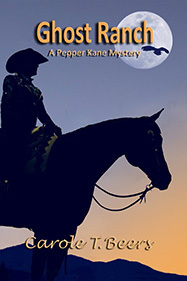 Published March 20, 2019: Night Rides—Book Four of the Pepper Kane Mystery Series. Pepper and friends bring their horses from Oregon to a Seattle show to vie for jackpots that will kick up their plans for a Western Bed, Barn and Breakfast. On the eve of the show Pepper hears violence going down in a fairgrounds restroom, and learns someone was killed. Security is slow to help. Her Lakota-police partner is busy with another case. A transgender rider is threatened. 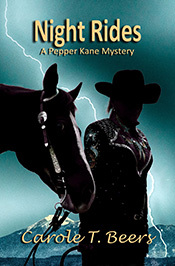 When Pepper’s daughter doesn’t return calls and Pepper herself is threatened, she sticks the spurs to her sleuthing. Review Copies of Saddle Tramps, Over the Edge, Ghost Ranch and Night Rides are available FREE to bloggers and reviewers upon request. Go to my secure Contact page, say who you are and where your review or blog will be found, and request your copies now.